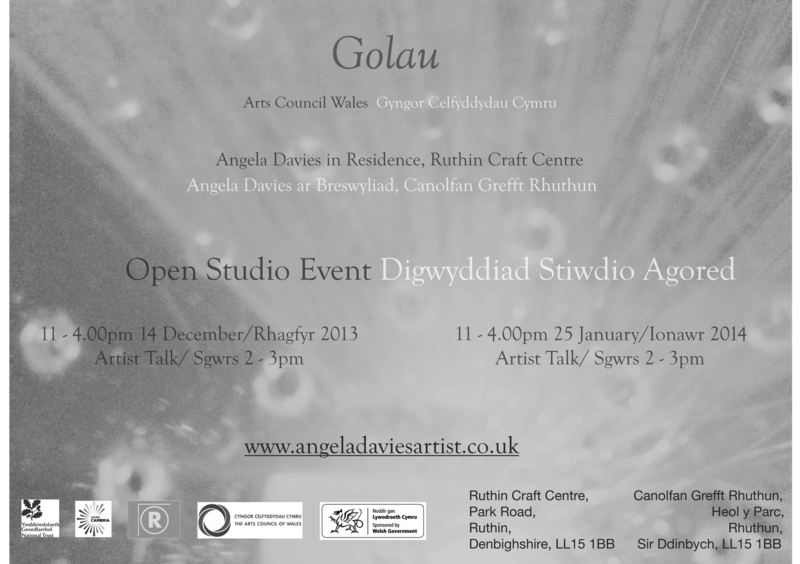 I am pleased to share with you news of my current Arts Council Wales funded project – Golau. I would like to invite you to an open studio event at Ruthin Craft Centre, to share the creative journey so far – please see attached and below for further details. Please feel free to circulate. Angela Davies is working in partnership with the National Trust and Ruthin Craft Centre over a 6 month residency. A site-responsive sensory installation of light and sound will be installed within the Adams Tower at Chirk Castle. Angela will be working in collaboration with Francesca Simmons: a musician, Ant Dickinson: a composer, Angeline Kornecka: a dancer and Karen Heald: a film maker and Paula Budd for costume design. Lace acts as a metaphor for mapping the landscape of North East Wales. The work intends to transcend boundaries and communicate craft and contemporary practice with landscape as identity. To share the creative journey, Angela will be holding an open studio event on 14th December at 2pm, at Ruthin Craft Centre, where she will be in conversation with Ant Dickinson – sharing part of the collaboration so far. Please follow blog and see links below for further details.